Ethereum’s upcoming economic model might not be lucrative enough to sustain a secure, diverse and solvent validator network, according to digital asset research firm Delphi Digital. 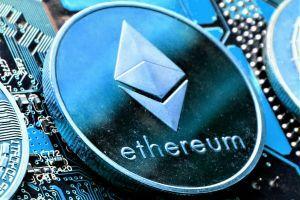 In their new report concerning the biggest dapp (decentralized application) and smart contract platform, researchers outline a dilemma that the planned trade-off between the network security and ether issuance calls into question the platform’s long-term viability. “We absolutely believe that continued Ethereum adoption and building on the platform will help the fee market develop, but it becomes a bit of a chicken or the egg situation,” according to the 64-page report. After the successful Constantinople hard fork at the end of February, Ethereum is one step closer to moving away from the Proof of Work to the Proof of Stake consensus algorithm. Essentially, it will enable Ethereum holders to become network validators and use the weight of their balances to validate transactions. If any of the validators turn out to be corrupted, they lose their tokens as a punishment. The monumental change in the platform’s governance, also known as Ethereum 2.0 Serenity Upgrade, is set to begin sometime between Q4 2019 and Q1 2020. The shift will enable faster synchronous confirmation times, higher scalability, and quick virtual machine (VM) executions. 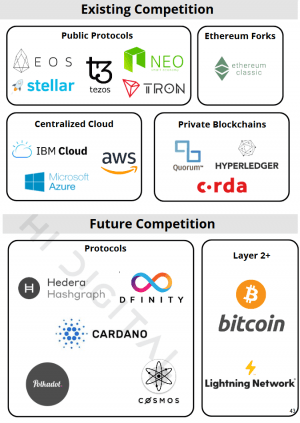 The report points out that Ethereum has won the short-term race to network effects, but now the game is turning into the race to scale. In fact, many platforms already boast of better scalability, but it usually comes at the expense of decentralization and its benefits. “Our primary concern is that Ethereum’s layer 1 scaling plans under Serenity will not be fully implemented until 2021 at the earliest. That is a long time for the platform to be in a state of flux. With the knowledge that significant changes are on the horizon, combined with the fact that the network still does not scale, will developers choose to build on another platform to avoid the headache?," the researchers asked. Aside from emphasizing issues in the current plan, the report also suggests a potential solution. 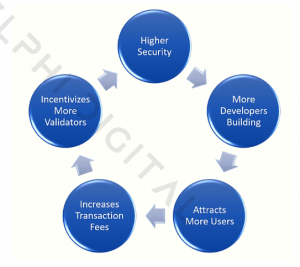 According to the research company, increasing the block reward would help the network to avoid a massive systematic risk, which would create a reliable buffer before the system can heavily rely on the fee market to support the validators. What about Casper, Sharding, and Plasma?